After spending part of last week in Lancaster doing summer things, I’ve also switched into my warm-weather wardrobe. All I need to do is find more petite maxi dresses. Do you know how hard it is to find those? Needles in haystacks, my friends. Maxi dresses are gorgeous, comfy, and great alternative for those of us who aren’t crazy about putting aging thighs on display in shorts. The problem with them is (tall girls, feel free to read ahead) that they’re all made for people who are at least 5 foot 6, usually more. I know that because as a regular wearer of three-inch heels, the regular maxi dresses still drag on the ground a bit. I’m five foot two. The same problem exists with pants, but to a lesser degree. Plus, I don’t find pants to be as appealing as loose, flowy maxi dresses. Especially not when it’s 90-plus degrees out. So here’s my plea to all clothing stores: please, in the name of all that’s summery and fresh and cool, make more maxi dresses for short women. You’ll be glad to not see our pasty legs. I promise. While I don’t aim for pale white legs in the summer, I do like white when it’s in chocolate. Then it’s fine. Was that segue a bit rough for you? Well, I tried. These bars are thick and fudgy in that white chocolate kinda way. 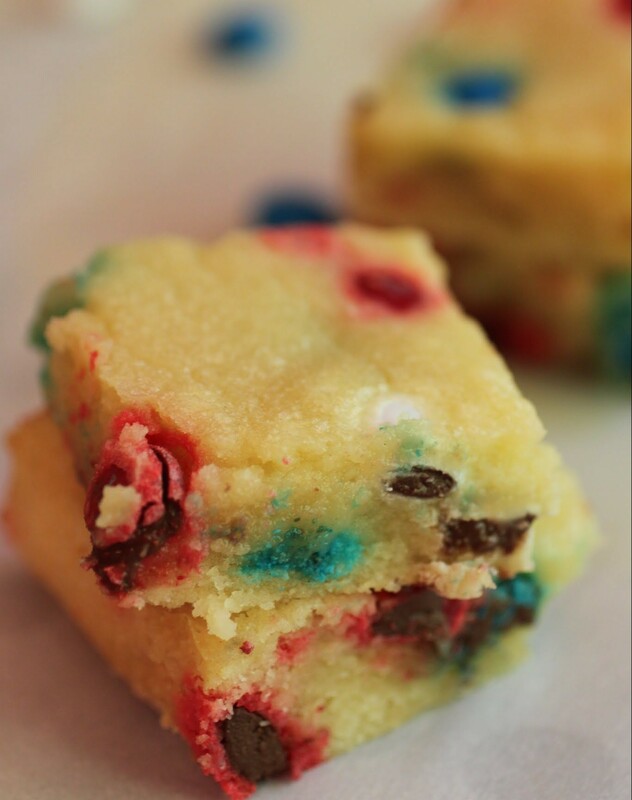 They’re very simple to make: all you do is (carefully) melt white chocolate with butter in the microwave, mix in a few other ingredients, stir in the M & Ms, and bake. It’s that simple. As simple as throwing on a maxi dress. Well, almost as simple. Over my time as a baking blogger, I’ve come to realize that simplicity is the first thing I look for in desserts. Baking desserts is a labor of love, and love shouldn’t be hard. Every now and then, it’s okay to spend a lot of time on something. But as a rule? Nope. And fashion is the same. Basics can be best, as long as they have a bit of funk or flair. My maxi dresses work great as long as they don’t drag on the floor and have a bit of fun detail. 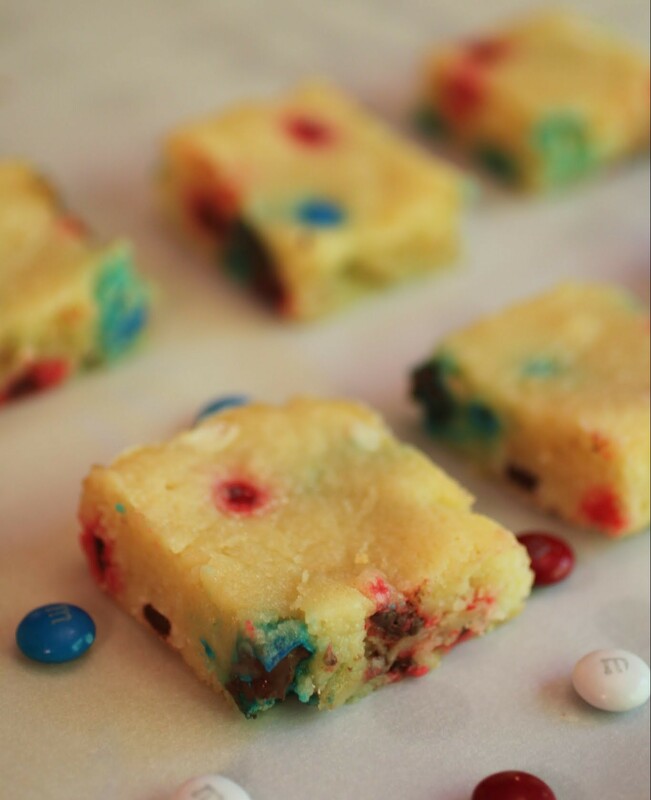 And these M & Ms add just the right detail, and flair, to these simple bars. Preheat the oven to 350. Coat a foil-lined 8-inch square pan with cooking spray. Set aside. In a microwave-safe bowl, melt the butter and white chocolate chips for 1 minute. Stir until smooth, microwaving in 20-second intervals if needed to melt the chocolate. Do not overheat! Stir in the eggs, sugar and vanilla until fully incorporated. Mix in the flour and stir again. 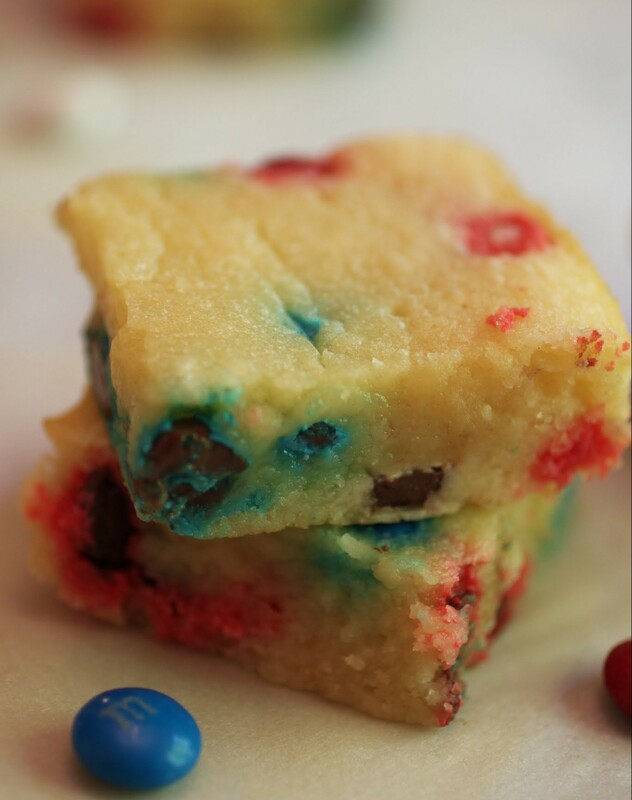 Fold one cup of M & Ms into the batter, reserving the rest to press into the top. 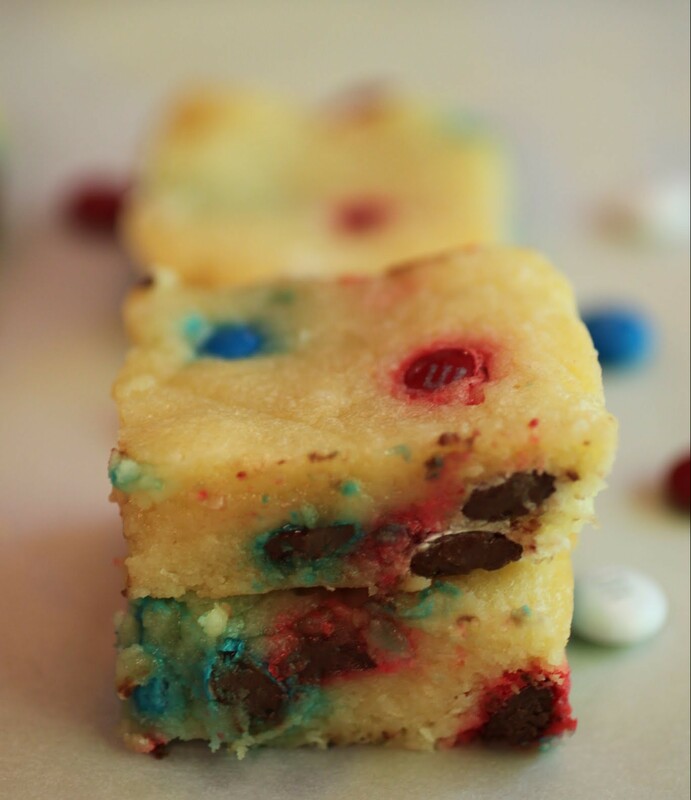 This recipe looks like the perfect way to use those M&Ms. I went to the M&M shop in London recently – I could have seriously lived in there. They’re super addictive and one of my personal faves, Dannii! Oh these bars look perfect, Mir! I love that you used white chocolate in here. And those patriotic M&Ms are the best! I bought a few bags from Target, too. So much fun! Thanks, Gayle! Target is THE place to food blog shop! Mir, I feel your pain sister!!! we are like exactly the same size and height. . I am 5 2″ as well! and I know exactly what you mean!!! MAXI DRESSES!!!! argh!!!! I have a few (and I have no idea how I found these) that I am able to wear with flats. . but this summer, am having no luck. We might have to deal with the short dresses . . or long skirts that we have to hike up our waist so they are shorter. Ah, the pains of being short! 😛 I love these red white and blue bars. . I can’t believe July 4th is right around the corner! 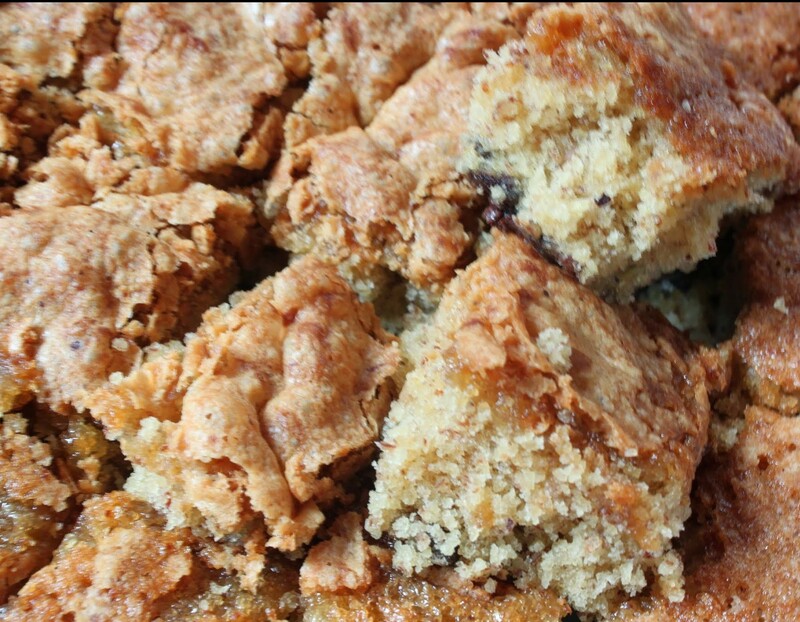 we were going to host a BBQ but looks like now, we’re going to an all day event with food trucks and kid’s activities with friends and the kids so the kids can play. . this at least puts the pressure off me for the menu but I might have to bake these bars to bring along! You are my twin, Alice. Let’s just face it. And I desperately want those dang dresses to fit! I like your July 4th plans much better. A food truck event is brilliant. No cooking for you! I totally agree with your baking philosophy! 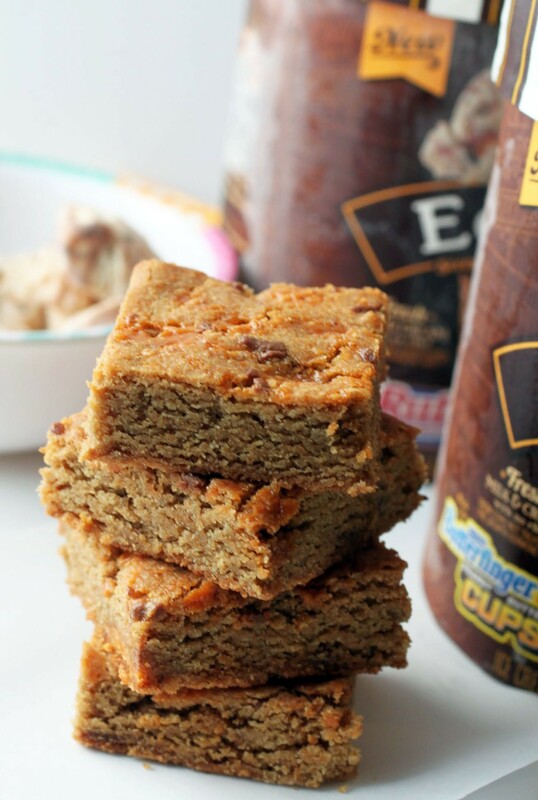 When it comes to baking (and other things in life), Keep It Simple Stupid – K.I.S.S.! Simple is really the best (and always delicious)! Yep. And that’s always a fun acronym, Heather! I have the same problem with maxi dresses I don’t even own one because they never fit! And I’m 5’5″! See? They’re made for super tall girls, Sam! So unfair. Don’t hate me because I’m tall! Maxi dresses are perfect for summer and I hope you’re able to find some soon! I can sympathize with not wanted to show of pasty white aging thighs for sure. 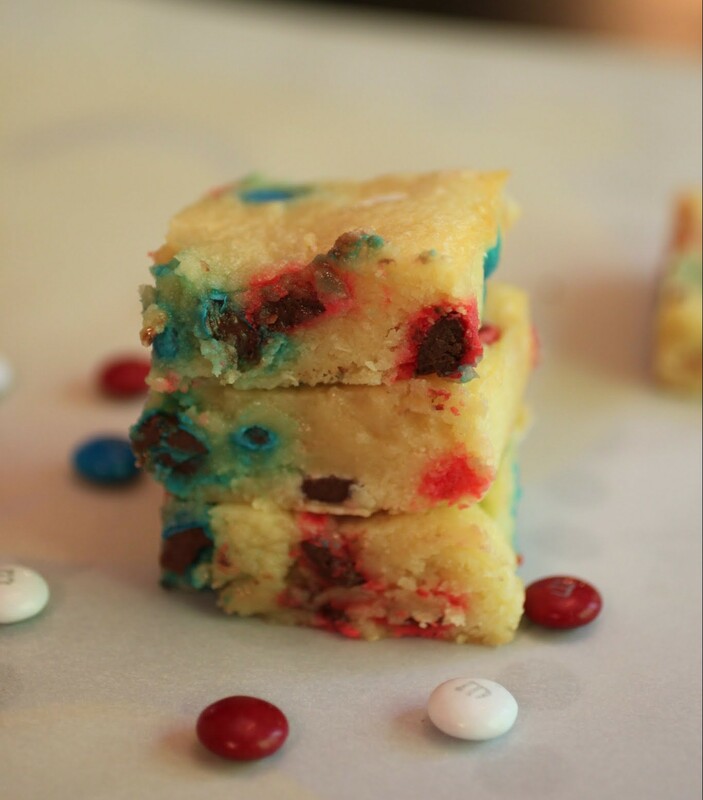 No shorts here, but holy stars and stripes forever I’ll totally take some of these white chocolate M&M bars! Jealous, but no hate, Rachelle! It must be nice to have all of them fit…oh happiness. Mir these are so much fun and so patriotic!! Love! Thanks, Jocelyn! I love holiday-themed M & Ms! It doesn’t have to be hard, Ambar! Remember that! lol so agree!! I don’t have a single maxi dress because I can never find one for my height! I am 5’2, just like you! The bars look great, love the use of white chocolate! Short girls unite, Manali! They never think of us when they make those gorgeous dresses….sigh. Thanks, Medha! They are festive. I like. melt in your mouth heaven! I can see just by the pictures that the texture of these were SO incredible! drooling over these! You got that right, Jess! We have to party! Mir – I’m 5’8″ and always have the opposite problem. Maxi dresses fit me really nicely, but all other dresses turn into shirts. 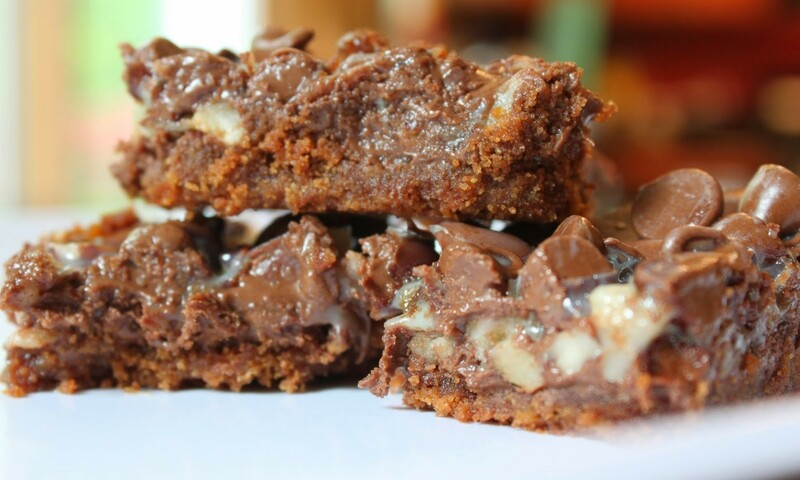 These bars look so moist and delicious. I’m a big M&M fan…especially the store in NYC! M&M heaven right there. 🙂 Thank you for sharing. And shirts fit me like dresses, Erin! That’s so funny! These are so fun, Mir! Love the red, white, and blue M&M’s. I have a couple of maxi dresses. I consider myself tall, at 5’5. But the dresses I own are still just a touch too long. I have to hold them up with one hand as I walk or I’ll step on the hems and trip myself, haha. See? They’re made WAY too long. I knew it!!! Thanks, Jen! Omg – I totally feel your pain Mir, I’m 5″5 and maxi dresses and wide leg trousers can be such a nightmare to fit! I always end up either altering them or having to wear reaaaallly high heels with them, and end up waddling around everywhere!! Hahhaah!! But, back to these bars – YUM! I love M&M’s and these look like the perfect sweet treat – love it! How tall do you have to be for clothes to fit? I wonder, I really do! “I like white when it is chocolate.” Lol right on Mir! I like you, how bout that. And I feel you as a fellow short girl, for the love of all things summer, make us some normal maxi dresses PLEASE. Maybe they just need some incentive like these bars, eh? I’m all over everything red white and blue right now, bring it on! Me too, Mary Frances! I love baking for the holidays. Gives me automatic inspiration! I totally snatched them up too; last year I couldn’t find them at all!! These look fabulous, obviously. How can you go wrong with M&MS?